I am a Principal Data Scientist in the Engineering Administrative Office and the Program Manager of the Open Source Projects and Applications and NSF Offices at the Jet Propulsion Laboratory (JPL) in Pasadena, California. I also am Director of the Information Retrieval and Data Science Group (IRDS) and Adjunct Associate Professor in the Computer Science Department within USC's Viterbi School of Engineering. At USC, I teach CSCI 599: Content Detection and Analysis for Big Data, a new course in the Data Science track. I used to teach CSCI 572: Information Retrieval and Search Engines and CSCI 578: Software Architectures. See the Teaching section below for more information. In case you are interested in my other work, my CV is available here. I also have a research statement that describes my vision for data science in terms of my existing training, and where I'm headed. You can also check out my Ph.D. dissertation. 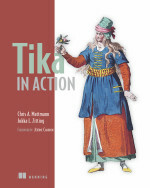 I wrote the Tika in Action book with Jukka Zitting and published by Manning Publications. Tika in Action is the definitive guide to a popular software framework for content detection and analysis that I co-inveneted (with Jérôme Charron) called Apache Tika. We followed Doug's model of naming the framework after one of our child's favorite stuffed toys. More on the origins of Tika are here. I also recently added information on my Students. We are now actively publishing our work from the DARPA MEMEX project. You can find the most recent publications here. I no longer maintain an exhaustive list of my publications. The easiest ways to stay up to date with them would be to scope out my CV, or to check out Google Scholar, or DBLP as it provides a reasonably up-to-date list of my publications, including links to electronic copies of the articles from publisher sites. Treasurer and Executive Officer, Apache Software Foundation. Member, Apache Software Foundation (first one from NASA to boot). PMC Member, Apache's Object Oriented Data Technology (OODT) project. PMC Member, Apache's Spatial Information Services (SIS) tool. PMC Member, Apache's Gora Object Relational Mapping technology. Project Management Committee (PMC) Member, Committer, Apache's open source search engine project, called Nutch. (Former) VP, PMC Member and Co-Founder, Apache's content analysis and detection toolkit, called Tika. (Former) Project Management Committee (PMC) Member, Apache's family of search-related software, Lucene. Dr. Jane Wyngaard - USC Postdoctoral Scholar & JPL Postdoctoral Scholar, working on Data Science for Radio Astronomy for the Reconfigurable Array of Portable Interferometric Devices (RAPID) thanks to the U.S. National Science Foundation Awards AGS-1343583 and AGS-1229036. Jane is also working on ARM-based open source data management, on the Earth Science Information Partners (ESIP) Federation Drone Cluster, on data management for the Low Frequency Aperature Array (LFAA) of the International Square Kilometre Array (SKA) project, and on Big Data problems in Polar sciences and intelligence problems related to the DARPA XDATA and Memex projects. Jane's work is currently supported by the U.S. National Science Foundation Awards PLR-1348450 and PLR-1445624. Dr. Ji-Hyun Oh - USC Postdoctoral Scholar, and Jet Propulsion Laboratory Affiliate, working on adding support in Apache Tika to crawl and parse information from geosciences software repositories on Github, thanks to the U.S. National Science Foundation Award ICER-1440323. Ji-Hyun has now graduated and is a Research Fellow at the APCC Climate Center in South Korea. Dr. Kim Whitehall - Howard University Ph.D. graduate in Atmospheric Sciences, working on an automated graph-based algorithm for identifying mesoscale convective complexes (MCCs) in satellite IR data thanks to NASA contributions to the U.S National Climate Assessment (ID: 11-NCA11-0028) and NASA's Advanced Information Systems Technology (AIST) program (ID: AIST-QRS-12-0002) and through the NASA Computational Modeling and Cyberinfrastructure (CMAC) program (11-CMAC11-0011) and to the U.S. National Science Foundation Award ACI-1125798, a component of the G8 initiative. Kim is now an Engineering Applications Software Engineering, Level II, at JPL in the Computer Science for Data-Intensive Applications Group. Dr. Jaeyoung Bang - Ph.D. graduate (advisor Dr. Nenad Medvidović), working on collaborative software modeling including Apache Open Climate Workbench thanks to a TA-ship with the USC Computer Science Department and to funding from his advisor. Jae has completed his Ph.D. at USC! He is now a Software Engineer at Kakao Corp. in South Korea.